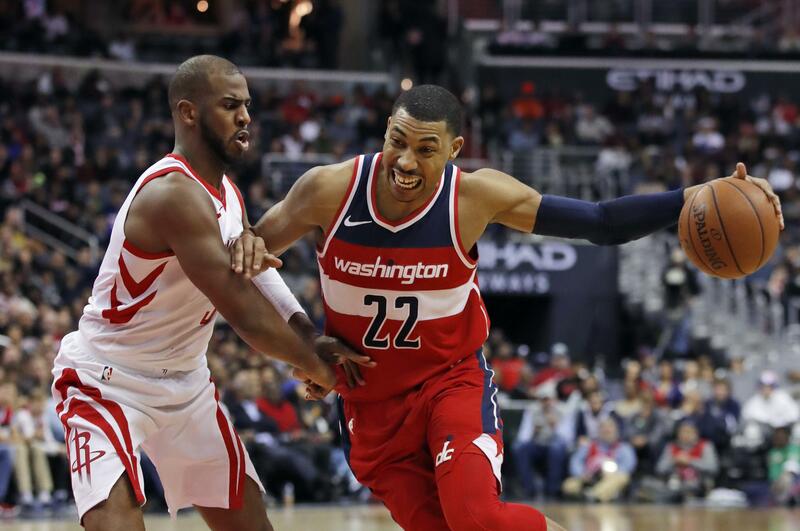 Otto Porter Jr. scored 26 points, Bradley Beal and Kelly Oubre Jr. had 21 each, and the Washington Wizards beat visiting Houston 121-103 on Friday night for the Rockets’ fifth straight loss. The skid is Houston’s longest since dropping seven straight from Jan. 9-19, 2013. NBA scoring leader James Harden matched his season low with 20 points for Houston. Chris Paul returned after missing three games with a strained groin. He had eight points and six assists in 26 minutes. A night after blowing a 26-point lead in Boston, the Rockets held their last lead midway through the first quarter en route to their worst defeat of the season. Bucks 97, Thunder 95: Giannis Antetokounmpo scored 23 points, including the questionable winning basket with 1.3 seconds left, and visiting Milwaukee ended Oklahoma City’s six-game winning streak. Replays clearly showed Antetokounmpo stepped out of bounds on his drive, but officials Derek Stafford, Ben Taylor and Leon Wood refused to review the play after the buzzer sounded, despite the pleas of Thunder coach Billy Donovan and several of his players. Russell Westbrook led Oklahoma City with 40 points, 14 rebounds and nine assists. Paul George sat out because of soreness in his left knee. Hornets 111, Warriors 100: Dwight Howard scored a season-high 29 points and the Hornets won just their third road game of the season, derailing the red-hot Warriors in Oakland, California. Charlotte, beginning a four-game road trip, arrived with a 2-12 record away from home. But six Hornets players scored in double figures, led by Howard, who also had 12 rebounds and seven assists. Kemba Walker made just two of his first 12 shots, but warmed up to score 16 points. Kevin Durant led the Warriors with 27 points and Klay Thompson scored 24, 13 of them in the first quarter. Draymond Green had eight points, 11 rebounds and tied his career high with 16 assists. Mavericks 128, Pelicans 120: Dennis Smith Jr. had his first career triple-double and visiting Dallas made a franchise-record 22 3-pointers in its victory over New Orleans. Smith had 21 points, 10 rebounds and 10 assists. He was 5 of 7 from 3-point range and 8 of 12 overall. Wesley Matthews made 4 of 7 3-pointers and scored 18 points, and Devin Harris hit 5 of 7 3-pointers and added 17 points to help Dallas win three consecutive game for the first time this season. Dwight Powell scored 15 points, J.J. Barea had 14 and Harrison Barnes and Dirk Nowitzki 13 each. Anthony Davis led the Pelicans with 33 points. DeMarcus Cousins had 32 points and 20 rebounds. Bulls 119, Pacers 107: Rookie Lauri Markkanen scored a career-high 32 points, Nikola Mirotic added 28 and surging Chicago beat visiting Indiana for its third consecutive win. Hot-shooting Chicago made 18 of 39 3-point attempts in its 10th win in 12 games. Robin Lopez and Bobby Portis each scored 12 points, helping the Bulls to their seventh straight home win for their longest such streak since a seven-game run spanning two seasons in 2013. Darren Collison scored 30 points for Indiana. Nets 111, Heat 87: Joe Harris scored a career-high 21 points, Rondae Hollis-Jefferson added 18 and visiting Brooklyn embarrassed Miami. Caris LeVert and Jarrett Allen each had 12 for the Nets, who were actually down 18-8 early – then outscored Miami 85-37 over the next 28 minutes. LeVert added a career-best 11 assists. It matched the biggest win by the Nets over the Heat ever, going along with the 24-point victory by New Jersey on Dec. 1, 1989, which was early in the second season in Miami franchise history. Josh Richardson scored 19 points 17 for Miami. Suns 111, Kings 101: Devin Booker shook off a rough night shooting and scored 12 of his 26 points over the final five minutes to lift visiting Phoenix past Sacramento. Booker missed nine games with a left adductor strain before returning to score 32 against Memphis on Tuesday night. He wasn’t as crisp against the Kings, shooting 9 of 25 from the field, but helped rally the Suns with his late scoring flurry that keyed a 17-4 run. T.J. Warren led Phoenix with 26 points and 10 rebounds. Zach Randolph had 14 points for the Kings. Raptors 111, Hawks 98: DeMar DeRozan scored 25 points, Jonas Valanciunas had 13 points and 11 rebounds and Toronto beat Atlanta for its 11th straight home victory. Toronto is an NBA-best 13-1 at home. The Raptors were 11-3 in December, their best record ever in the month. Taurean Prince had a career-high 30 points and 10 rebounds for Atlanta. Clippers 121, Lakers 106: Playing in his first game in a month, Blake Griffin scored 24 points and Lou Williams added 23 off the bench to lead the Clippers to a victory over the Lakers. It was the Lakers’ fifth consecutive loss and eighth in nine games. Jordan Clarkson led the Lakers with 20 points and Brandon Ingram added 18, all coming in the second half. Julius Randle had 18 points and Larry Nance Jr. added 16. Montrezl Harrell had 15 points for the Clippers, and Austin Rivers added 13. Griffin had been out with a knee injury. Published: Dec. 29, 2017, 11:50 p.m.